In recent years, the biological, earth and environmental sciences have seen an explosion in the availability of information about the natural world through new observing technologies, open access databases, bioinformatics and citizen science. Students and graduates in these disciplines clearly require improved quantitative skills to make sense of all these data, and it is now commonplace that employers will expect our graduates to have computer coding skills. Students in the biological sciences, however, often approach the acquisition of quantitative skills with a degree of reluctance. I will outline our efforts within the School of Biological, Earth and Environmental Sciences to improve the quantitative skills of our students at all levels. These include revisions to undergraduate courses, discussion groups and help sessions, short courses for research students and an extensive set of online resources available to all our students throughout their degree. Meeting our aims requires an approach beyond single courses, and we have developed a strong culture of sharing expertise among staff and students (many of which have skills that the academic staff lack). Alistair is an ecologist and evolutionary biologist with a research focus on marine invertebrates, seaweeds and seagrasses. 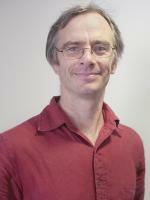 He teaches invertebrate biology, marine ecology and data analyses for life and earth science students. He is active in programs aimed at improving the quantitative skills of students across the School of Biological, Earth and Environmental Sciences (BEES).